Super Touring - Super Touring includes many of the same makes and models found in Touring. However, this category allows engine modifications and aerodynamic body enhancements. Additional manufacturers competing in this group include Porsche Cayman GT4 and BMW M235iR. 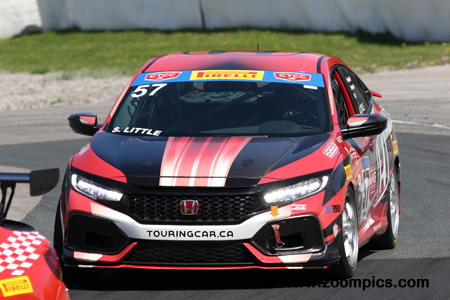 The Victoria Day race weekend at Canadian Tire Motorsport Park (CTMP) included the NASCAR Canadian Tire and Pirelli World Challenge series. 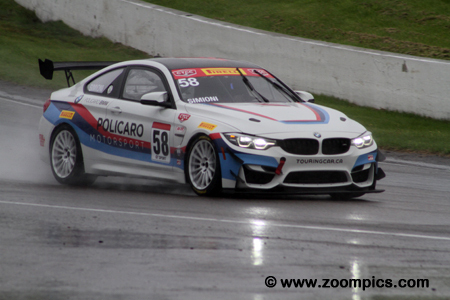 This event would be the Canadian Touring Car Championship’s season opener. Drivers would be competing in two forty minute races around the ten-turn 2.459-mile road course. The start of Saturday’s very wet contest. Fastest qualifier, Etienne Borgeat in the No. 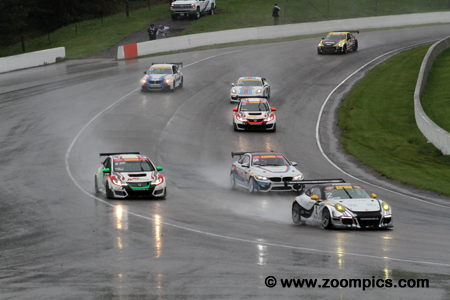 2 GT Racing Porsche GT3 Cup leads the field of sixteen drivers through corner two. Following Borgeat are the GT Sport competitors – Tom Kwok in a Honda Civic TCR and the BMW M4 GT4 of newcomer, Ethan Simioni. 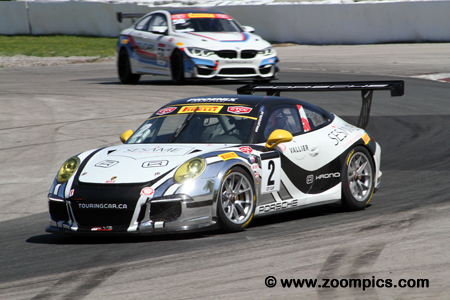 Etienne Borgeat driving the GT Racing prepared Porsche GT3 Cup won the opening rounds of the 2018 Canadian Touring Car Championship. In the first event of the weekend, Borgeat qualified on the pole but battled with the GT Sport drivers, Tom and Gary Kwok. After losing first place, he was able to regain the lead and take the overall victory. On Sunday, Borgeat won by a comfortable 13.293-second margin. 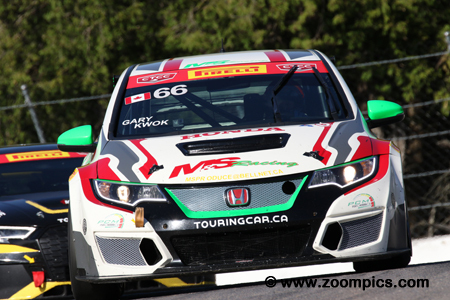 In 2018, the M&S Racing acquired a second Honda Civic TCR – prior to this Tom and Gary Kwok shared the car. The No. 66 Civic was driven by Gary Kwok. In round one, Kwok qualified sixth overall and fourth in GT Sport. Taking advantage of Saturday’s wet conditions it appeared that he could take the overall victory but he finished third. 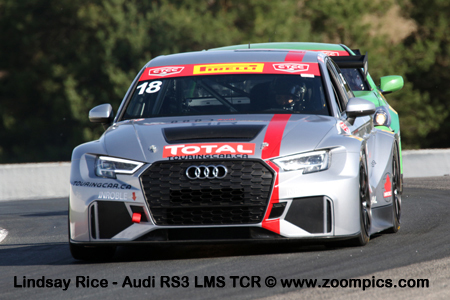 The following day, Kwok started fifth in class and captured the final spot on the podium. Sam Fellows son of legendary Corvette racer, Ron Fellows made his Canadian Touring Car debut at Canadian Tire Motorsport Park. In round one, Fellows qualified third quickest in the Super Touring category driving a BMW M235iR. Although he was down on power, Fellows proved that rain was the great equalizer and took the victory in wet conditions. On Sunday, he started fourth in class and took the runner-up spot. 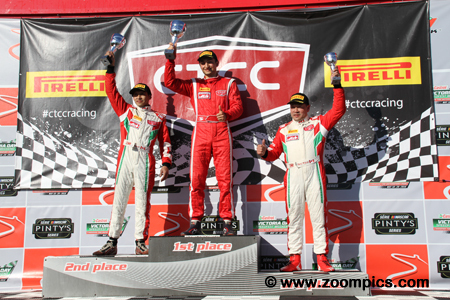 The round two Touring car podium at the Canadian Tire Motorsport Park. On the right is the third-place finisher from Can-Saf Racing, Marlin Langeveldt. To the right, making his series debut, is the runner-up, Shawn Little. Between these two drivers is the winner, Paul Joakim. Joakim was one of eight drivers making their first series start this weekend. 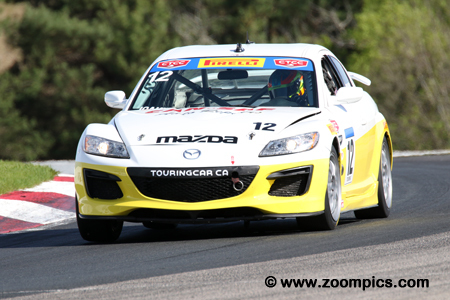 Newcomer, Paul Joakim drove the Can-Saf Motorsports prepared Mazda RX-8. It was a great initial outing for Joakim. 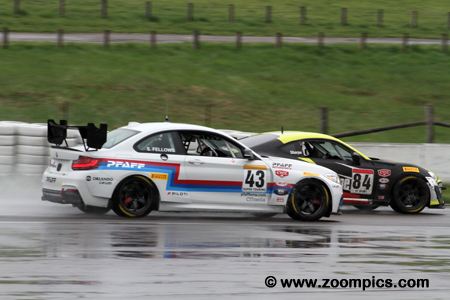 In the wet conditions on Saturday, he qualified and finished second in the Touring category. The following day, Joakim was gridded fourteen overall and first in class. After forty-minutes of racing, he was the class winner. Another newcomer, Ethan Simioni drove karts last year and transitioned to a BMW M4 GT4 for his series debut. Simioni started the Policaro Motorsports entry third overall and first in the GT Sport category. Unfortunately, he could not maintain the pace of the Kwok brothers and finished fourth in class. Race two was run in better conditions and Simioni took the class victory. 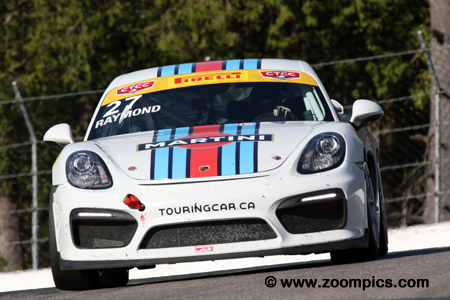 After winning 2017 CASC-OR GT-2 title, Marc Raymond moved to the Canadian Touring Car Championship in his Porsche Cayman GT4. Raymond qualified on the Super Touring pole for the weekend’s first contest but could maintain Sam Fellows’ pace and finished second. He fared better on Sunday and took the class victory. The second M&S Racing entry was driven by former Super Touring champion, Tom Kwok. The series veteran competed in the GT Sport category with his brother Gary. It round one it appeared that Kwok may finish first overall but he settled for second and took the class victory. On Sunday, the driver of the No. 55 Honda Civic TCR qualified fourth and captured the runner-up spot in GT Sport. 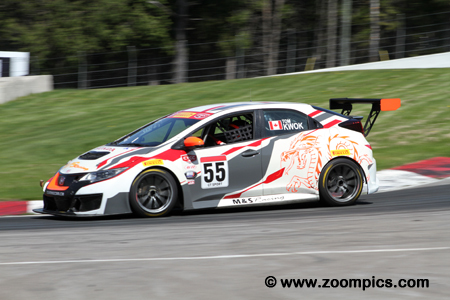 The Velocity Motorsports Club have participated in the Canadian Touring Car Championship for a number of years. Their regular driver, Scot Nicol has stepped aside this season and has been replaced by Shawn Little. Little driving the team’s Honda Civic Si in the Touring category was on pace. In Saturday’s event he started and finished first in class. On Sunday, Little was second in his group. 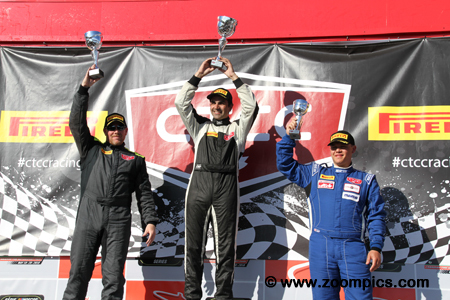 The round two GT Sport podium at the Canadian Tire Motorsport Park. On the right is third-place finisher from M&S Racing, Gary Kwok. To the right is the runner-up and Saturdays winner, Tom Kwok. Between these two drivers is the class winner, Ethan Simioni. Simioni was one of five drivers taking a victory in their series debut – the others were Sam Fellows, Paul Joakim, Shawn Little and Marc Raymond.